February 2, 2011 (New York, NY) – Johnson & Johnson, Sony, Crest and BMW appear at the top of the First Annual "Most Desired Brands in the U.S." Report. The report, released by leading global strategic neuromarketing firm Buyology Inc, is the first to quantitatively type and measure consumer relationships with brands. The full report can be found at www.buyologyinc.com. The Most Desired U.S. Brands Report is the result of more than 6 years and $8 million, testing 240 global brands with more than 5000 consumers. The Brand Most Desired by Men in the U.S. is Crest? Hyundai (#5) is more desirable than Lexus (#10)? Really? Roger Dooley discussed these and some of the other less predicted [i.e., completely surprising] findings at his Neuromarketing blog, noting that "The actual methodology used to produce this brand ranking is a bit sketchy." So what are the elusive Neurotypes™? Neurotypes™ quantitatively determine which of sixteen relationships a brand or business currently has for a given target audience and the relative strength of the relationship, or signal strength, relative to competitors and other, beacon brands who, although they may be outside the category, have successfully established similar relationships. Once typed and calibrated, a marketer can use Neurotypes to assess the impact of their current marketing activities, determine what activities will be more effective in the future and gain provocative and proprietary insights on how to strengthen the brand's relationships across the 6P framework (product, package, placement (distribution), price, promotion and positioning). The Neurotype™ matrix yields a few surprises of its own. Taco Bell relates to its audience through Superiority and Harmony [just like Apple]. In contrast, Crest exploits the winning combination of Harmony and Superiority. Wal-Mart has a relationship of Exploration and Harmony with its customers [just like Facebook]. Each of these chemistry types is associated with a dominant neurotransmitter or hormone (serotonin, testosterone, dopamine, estrogen), according to resident anthropologist Dr. Helen Fisher. Although a simplistic caricature of personality differences, at least the proposed biological correlates are obvious. But where does the neuro enter the marketing picture for Neurotypes™? 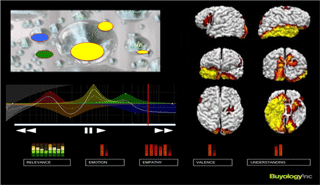 Buyology has developed proprietary physiological measurements based on brain and eye reaction to marketing stimulus that directly impacts in-market performance. These measures are collected either via Central Location Testing utilizing medical grade EEG and state-of-the art eye tracking equipment or via a global pre-recruited in-home panel via web-based stimuli and Bluetooth EEG collection equipment. The in-home methodology is web based, scalable and offers the client very quick results at a much lower cost while still providing superior results gathered in a more natural, in-home environment. Of course, we'll never be able to evaluate any of this, because the proprietary research is not peer reviewed. So it's black box phrenology, without the convenient localization map of its ancestors. "Although a simplistic caricature of personality differences, at least the proposed biological correlates are obvious." (of Helen Fisher's). Why would it be a "simplistic caricature" and "obvious"? Fisher's "builder" seems to be related to Cloninger's Harm Avoidance, but both Big Five's Neuroticism and Conscientiousness. To me Conscientiousness is not "obviously" associated with serotonin. And I am neither sure about Neuroticism. Great post! Gotta love those neurocharlatans. 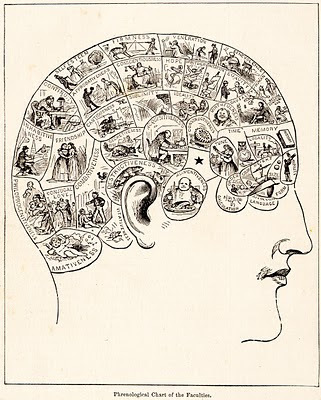 These days, getting a faculty position is as likely as winning the lottery, so maybe I should start my own phrenology enterprise. Finn Årup Nielsen - Oh, I meant the more basic fact that there are specific biological correlates is obvious. Associating one neurotranmitter or hormone with a personality type is the "simplistic caricature" part. BUT: "We're a combination of all four systems," Fisher says [even in the USA Today article]. In contrast, "Neurotypes" seem to have no basis at all in biology. "Overall, several core theoretical assumptions and predictions associated with the psychobiological model and TCI-R assessment are either non-falsifiable, in conflict with each other, or not supported by empirical evidence." I think Buyology's brand is based on a careful combination of Bravery, Utility, Love, Laughter, Solutions, Help, Impressions and Tempo. Proprietary sounds a bit like snake oil. Even if they are on to something with their eye movement measures (but doubtful), they are certainly off on a delusive journey with their abstractified categorizations and interpretations. But you have to admire the audacity of marketing this absurdity to marketers. They couldn't even get a real psychologist/neuroscientist... they had to settle for anthropologist as their "in-house expert."